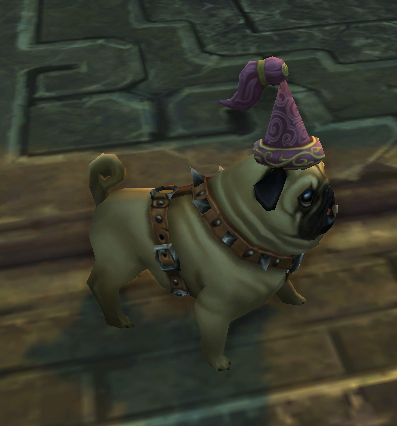 There was oddly very little information imparted at Blizzcon about pets. 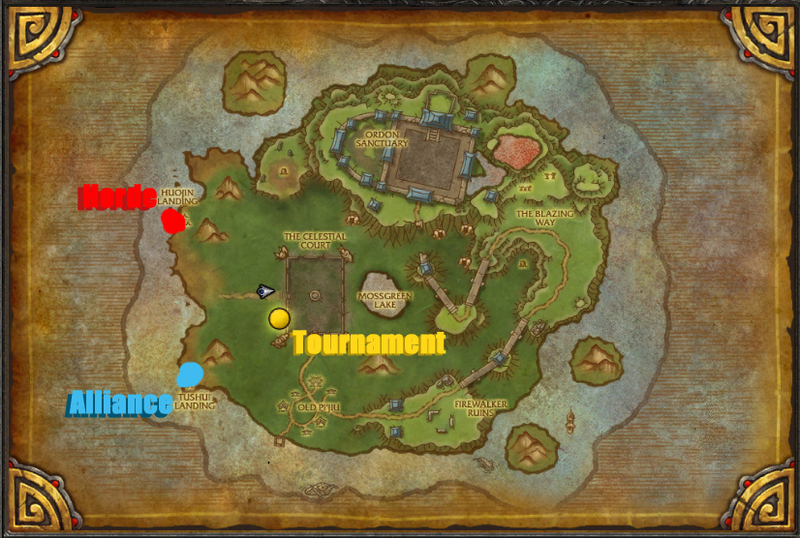 I’m pretty sure yak mounts were mentioned more on the livestream than my favorite niche minigame. 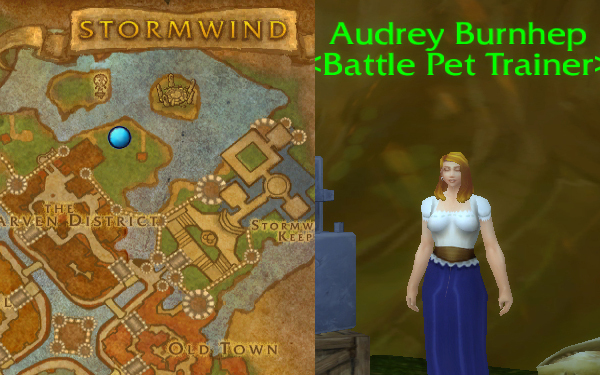 There was one question in the Open Q&A, whether there’s going to be pet battling anytime soon for mobile devices. The response was largely positive, but in the Blizzard “Soon(tm)” vein. Beyond that, there was one very small tidbit of information, enclosed in the official spiel about Garrisons. 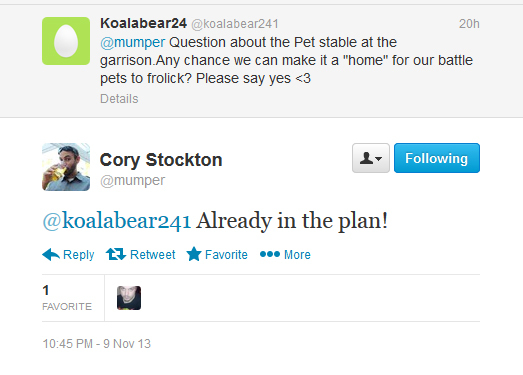 Apparently one of the buildings in the Garrison, the new, upgradeable player housing, will be a Pet Stable. There seems to be a few listed iterations of this, including a Barn, a regular Stable and a Pet Stable, but that’s unsurprising since part of the stated Garrisons mechanics involves upgrading your buildings. It took a bit of digging, and some begging friends at the con to maul Cory Stockton’s face (with questions) to find out exactly what this pet shed out back entails. 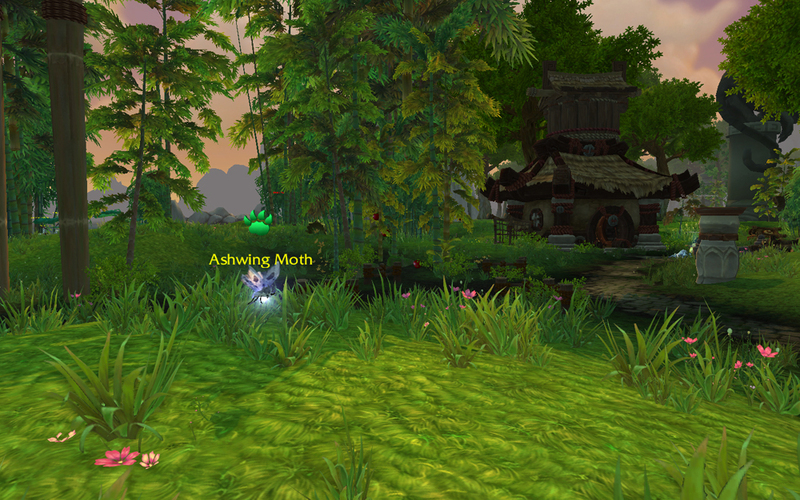 Firstly, it looks like it serves as a place to sort of display your fuzzy (or scaly, or gooey) friends in-game. PET BREEDING. TO GET EPIC PETS. 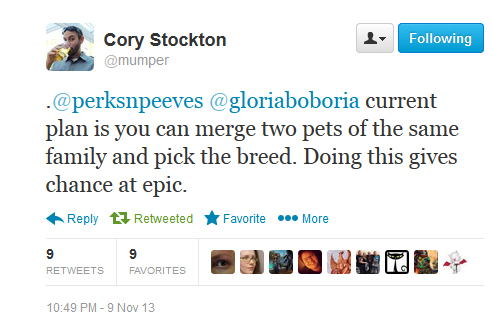 That is WoW Forum MVP Alona, who had a discussion with Cory Stockton, a lead game dev also known as @mumper on Twitter. Of course, they both could’ve been, let’s say, enjoying the Blizzcon Spirits at that point. 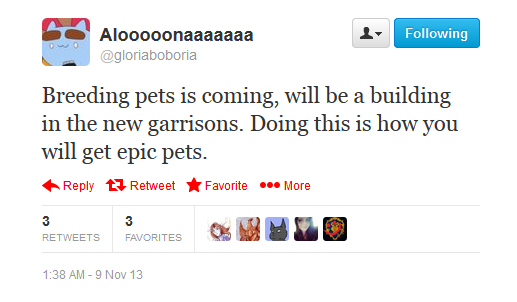 Tweets are relatively unofficial, but I’d say this is good enough to confirm Pet Breeding as a function of Garrisons. 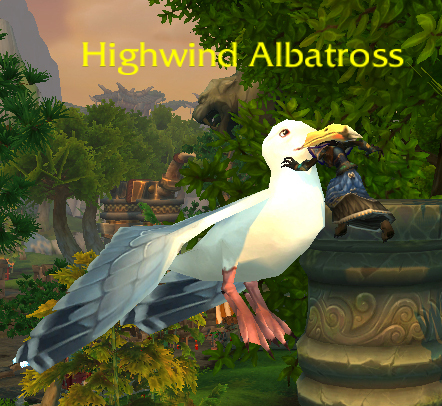 We know that this is how we get new, epic pets. Alona also contributed from this conversation that the pet level cap will not be increasing, leaving us free to level our new epic pets. What we don’t know yet is pretty much everything else. How often we can breed them. What it will do to skills. What kind of screwed up abomination skins the final product will have (I’m totally breeding a Valkyr and a Scourged Whelpling just to see what pops out). However, we also don’t know how this will affect our current pets, and if Radley gets destroyed in order to ‘merge’, forget that idea. Alona also says that Corgis are a ways off, which I know lots of collectors (especially her) are sad about. However, I’m thrilled to say that the peacock Elepheagle and I have been hounding Mr. Stockton about is in the offing for 6.0. I do not have a better source for this than twitter hearsay, but the #arWAAARRRK and #mumperpromisedmeapeacock hashtags have been a long-running inside joke between the two of us, so I’m pretty excited for this even if it ends up as just a rumor. There were a couple slides from the art panel which looked intriguing as possible future pets (especially this little enraged flowerperson) but at this point that’s speculation on my part. 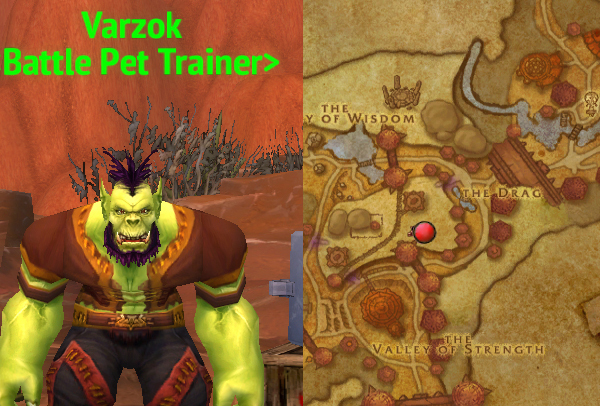 I don’t think I’ve made much of a secret of my disappointment in how little pet information came from Blizzcon, but I do think that breeding has potential to be really cool. 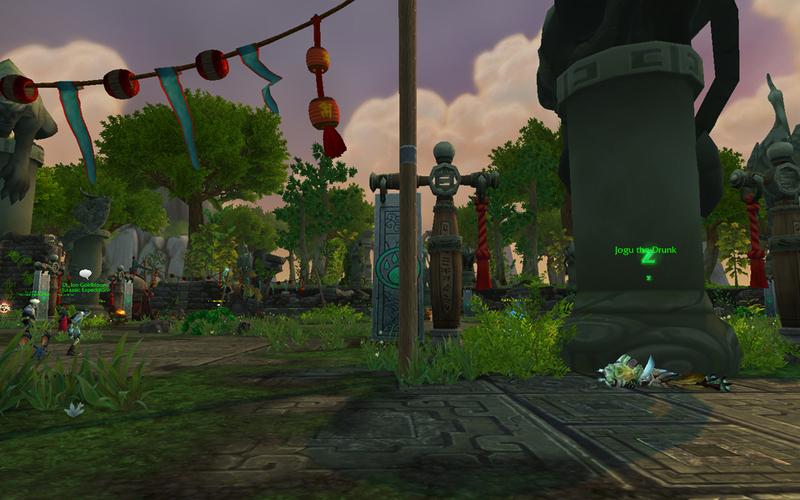 We’ll see as we move into beta and get more first person accounts of garrisons. 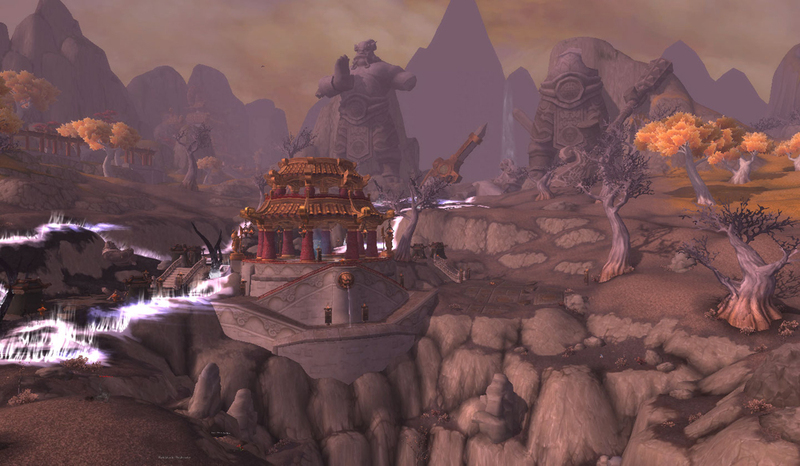 This entry was posted in Uncategorized and tagged 6.0, featured, garrison, Warlords of Draenor on November 10, 2013 by Liopleurodon.